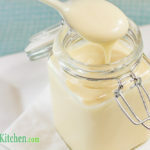 Keto Mayonnaise - Homemade Whole Egg - The Healthiest Mayo Around! We’ve used a delicious blend of Macadamia Oil and Light Olive Oil to create a lightly flavored Whole Egg Keto Mayonnaise. Place the eggs and mustard into your food processor and blend on medium speed for 3 minutes, until well combined. Place the oils into a measuring jug and slowly pour into the food processor while it is running. If you pour the oil too quickly you run the risk of splitting the mayonnaise. If the mayonnaise is too thick, add the vinegar to thin it down.